Living on the road, you have to find a new place to sleep every night, which sometimes can be an adventure. You also have to find your own “style”, meaning that you have to find out in what kind of places you feel comfortable sleeping. Below is a short summary of the places where we slept in the different countries we traveled through. It is on purpose not very detailed but might serve as inspiration. Highway rest areas: In Canada, we slept most of the time in one of the many clean rest areas with toilets along the highways. Often they are a little bit off the road and surrounded by forest/green areas. Crown forest: State owned forest is another good place to sleep. Free to use by anyone. City/communal camping area: In some of the smaller towns in British Columbia we found public camping areas, for free. They are not sign-posted very well so keep your eyes open or just try to follow one of the “camping”-signs. Safeway or Walmart parking lots: Just remember to ask first. 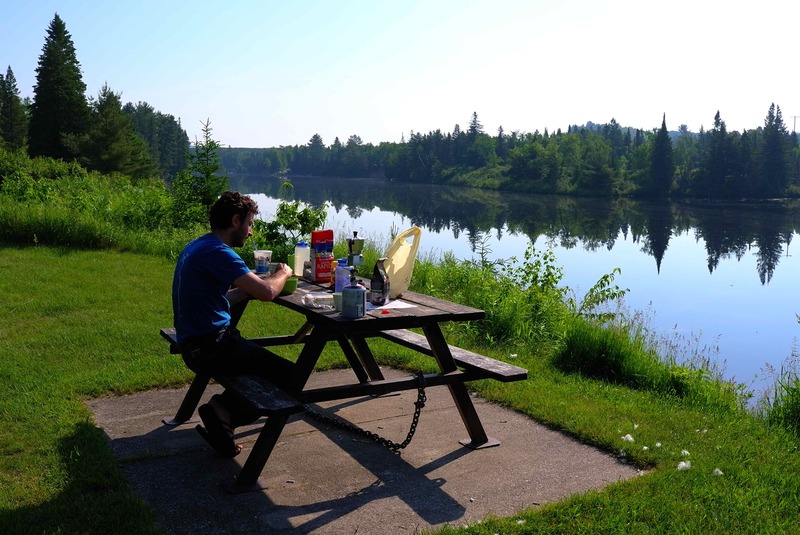 National parks camping areas: In the national parks it is obligatory to use the designated camping areas. We generally paid between 10 and 25 CAD per night. 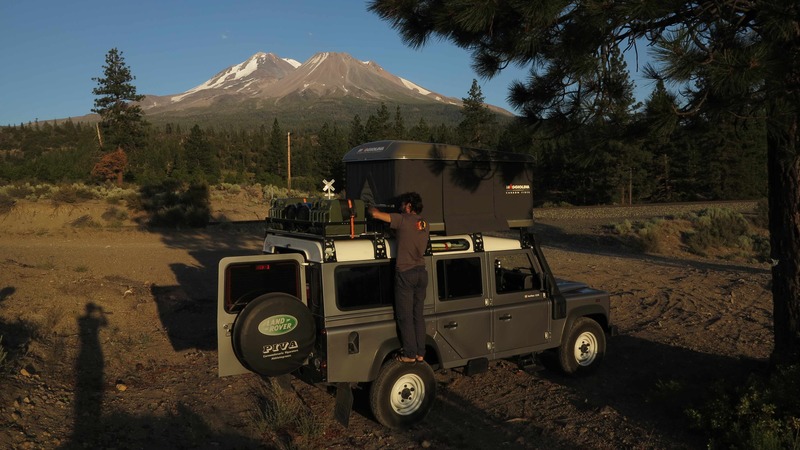 Off road: There are so many great places to park your car and sleep along the road in the western part USA. Pick your spot! Buy the book “Camping Mexico” by Mike and Terry Church! We only stayed in safe camping areas. Comedor: It is a good and safe option to stay outside a local comedor where the family is living next door. Ask if you can park overnight there, eat your dinner at the comedor and pay an extra tip for their kindness. Hotel parking lot: Ask if you can pay a small amount to sleep in the parking lot of a hotel, most often there is also a toilet you can use. Hotels/Hostels: In cities like Coban, Quetzaltenango and Huehuetenango we had to stay in a hotel or hostel as we failed to find any other good option. We had planned to stay outside a restaurant but it turned out to become a beer-drinking place later in the night – watch out for that. So we moved on and instead we spent a very quiet night outside the emergency room of the local hospital, paying the guard a tip to sleep there and use the toilet. In Matagalpa we stayed in a cheap hotel (Fuente Azul). The owner would not let us sleep in the car. In Granada we found a hotel owned by a kind Italian, who let us sleep in the car inside the gates (Hotel Maltese down by the Lake Nicaragua). 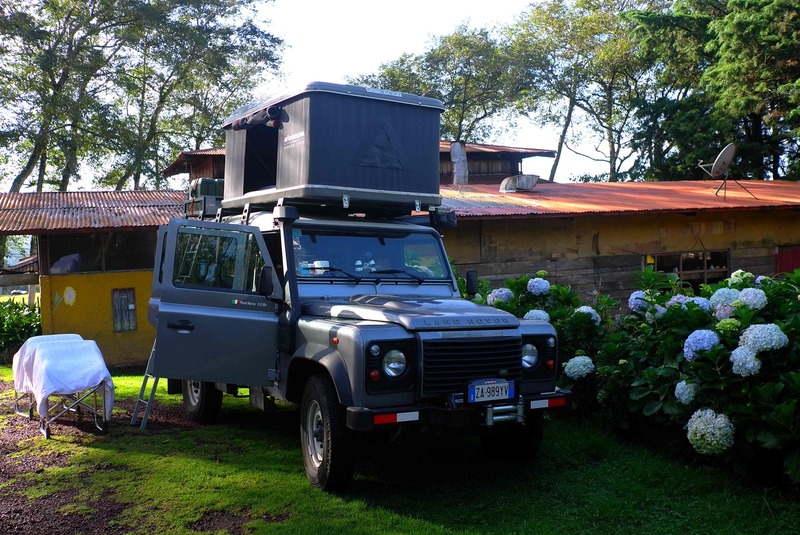 In Costa Rica we generally stayed at beach campings or in the parking lots of small hotels to have access to a toilet and sometimes a shower. We paid 5-10 USD. Close to Volcan Poas we found a public park with cheap camping. Toilets, no showers, very peaceful, 5 USD. Go down the road coming from Volcan Poas and turn left at the Restaurant & Hotel Jaulares. Drive for a couple of km until you reach the recreational park Laguna Fraijales on your right hand side. To the left there is another kind of recreational park/camping area but they asked for 15 USD for one night. Also on the left hand side there is a small supermarket. At the base of the Cherro Chirripo mountain we stayed outside the Restaurant Uran, 50 m from the trail head. We paid 5 USD. Hot shower 1 USD. Panama seems very safe and probably one could sleep safely almost anywhere. One major exception is Almirante on the Carribbean Sea, which is a banana port as well as the departure point for the boats to popular Bocas del Toro. Almirante is a very dangerous place at night. Don’t attempt to sleep anywhere in your car or in your tent in Almirante. 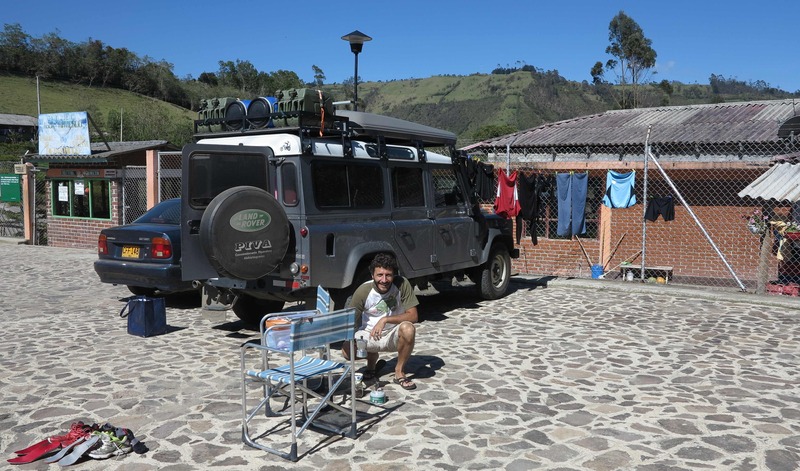 At Volcan Baru you can park and sleep at the small ticket office at the start of the trail. Pay your 5 USD to enter the park and sleep for free. There is a clean toilet and water. The ticket office is manned 24 hours. Tourist information/cafe along the road in the coffee tringle: Here they said that we could camp for free and that there would be a security guard at night. We did not take the opportunity though, as we wanted to sleep at one of the coffee farms. 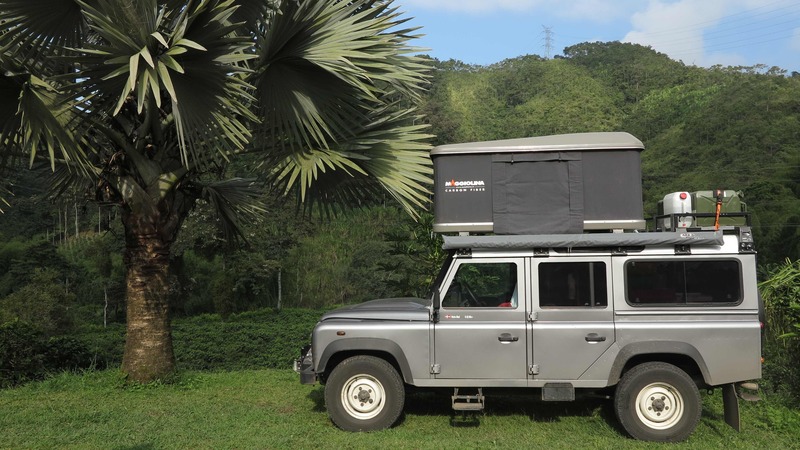 Coffee farms in the coffee triangle: They will charge you for camping but it is a nice option. Coconuco hot springs, on the way to the border with Ecuador: A bit off the main road, but camping is for free. You pay for access to the hot springs and get toilets and hot showers included. Open 24 hours so can be a bit noisy when people are going in and out but it is safe. 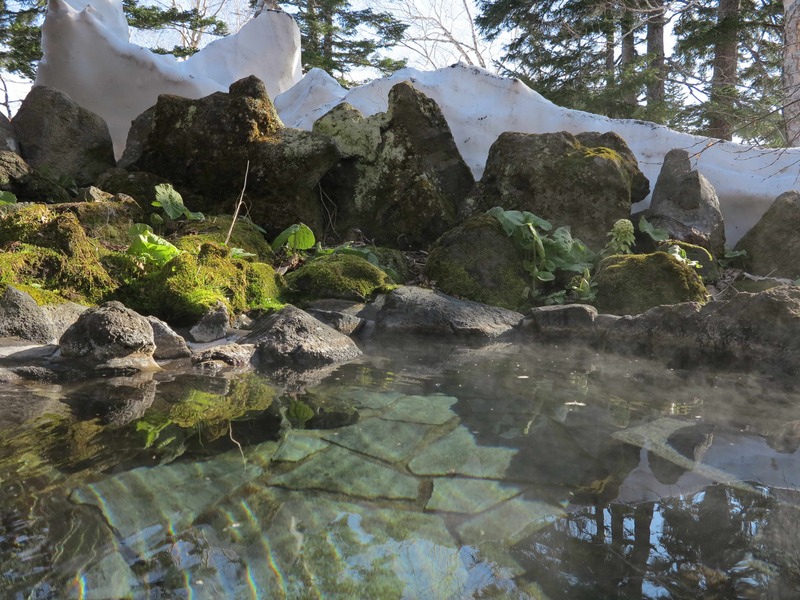 Coconuco hot springs – also a good place for taking a morning run before jumping in the hot springs! At the border Colombia/Ecuador: Hotel Mayasquer, 500 m from the border, they charge around 20 USD for camping with access to toilets. Safe and quiet at night. Illinizas: We slept for free at the parking area at the trail head to the Illiniza Sur and Norte. But you need an appointment with an approved guide to be able to enter! 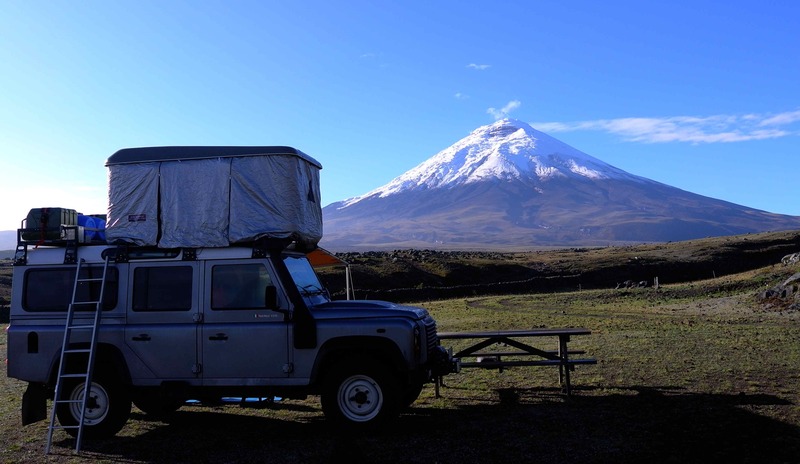 Cotopaxi: A bit expensive but lovely, we spent two nights at the Tambopaxi hut at the foot of the Cotopaxi volcano. We paid 7 USD each and had access to bathrooms and very hot showers. The view in the morning is fantastic. Saraguro: Going south from Cuenca to the border with Peru, there is a small village called Saraguro and a community run Hosteria called Achik Huasi where they let us camp in the yard for 3 USD each. Access to toilet and shower (but hot water was not working…). From here you can drive to the border with Peru in some 4 hours. A small part of the road is unpaved but roadwork was ongoing. We found Peru a little bit tricky and so we tried to be careful where we slept. Especially along the coast there is often nothing but desert or very poor villages. We mostly slept in the parking lot of hotels, sometimes we had to take a room. In Lima we can highly recommend the Hitchhikers Backpackers Hostel in the rich and safe neighborhood of Miraflores (Calle Bolognesi 400, Miraflores, LIMA 18, Perú, +51 1 2423008). They have space for parking a couple of “rigs” and a lot of motorbikes at the same time and it is a very friendly place to stay! As far as we remember, we paid 18 Sols per person per night. Northern Chile is very easy for camping. So far we just passed through on our way to Argentina and we found a good place to camp out for free every night. The stars are amazing! And so is the strength of the wind blowing at times… We exited to Argentina over Paso de Jama through the Atacama Desert. Beautiful and remote! The only advice we got was to avoid camping where the road passes close to Bolivia as robberies do happen there. Southern Chile along the “carretera austral” is surprisingly difficult for wild camping. Everything is fenced. You have a better chance of finding a quiet place in one of the small towns than out in nature. Central Chile – like in Argentina, here you find large petrol stations with good parking areas where you can stay overnight. Argentina is generally very easy and safe for camping. Off road: Find a quiet place by a river or by a lake. But watch out for weekend asados (barbeque parties)! Petrol Stations: Many petrol stations in Argentina have large areas for parking. Just avoid parking close to the area for trucks as they will come and go till late in the night. Villages: Find a small village and see if there is a quiet place to camp on the main square or close to the sports field. Cafayate (NW): Avoid the dirty campsites in the city and instead head up into the hills. We slept in the hills on the northwestern edge of town; turn up a dirt road where there is a sign to “Desaguadero” and the vineyard Amalaya, pass the wineries along the road and pick a spot. Iguazu Falls (NE): Go to the Ecological Camping! Directions: Pass the american camping (Complejo Turistico Americano) on your way to Iguazu city. Then turn left on a dirt road at the Piedras Preciocas, at the end of the road turn left again, then take the second road right = Av Los Pioneros. 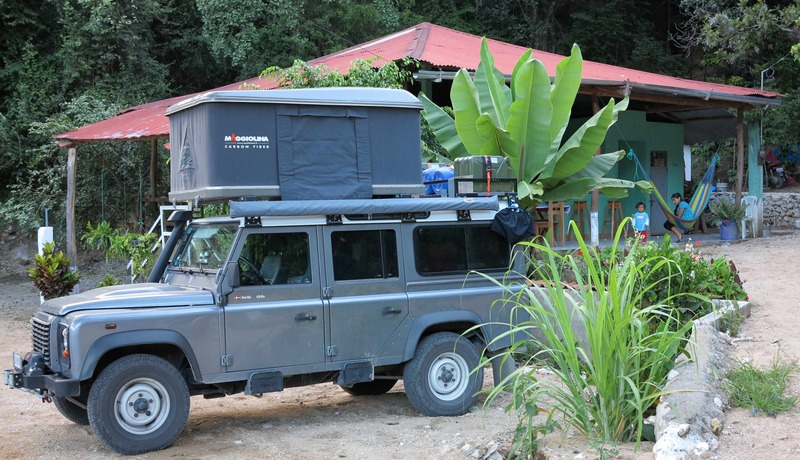 Drive about 500 m until you see a sign to the Camping Ecologico. Park your car and walk down the small road/path until you finally see a nice kitchen/lounge area and to the right a house. 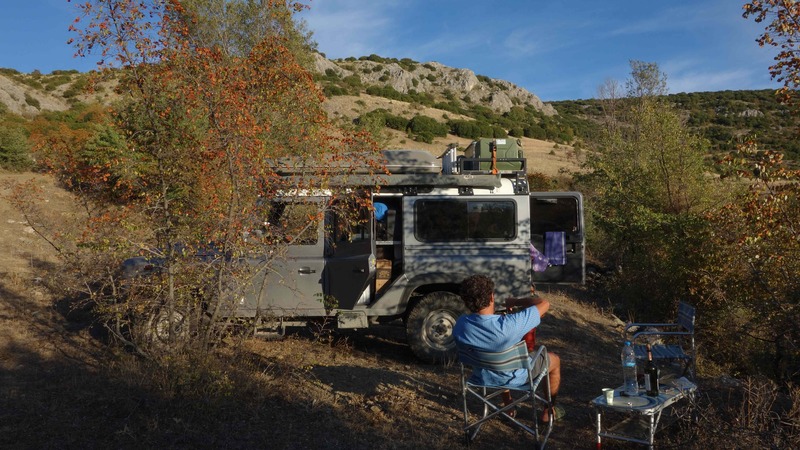 This is where Oscar lives, the absolutely lovely owner of the Camping Ecologico. Here it is peaceful, very clean, safe and you will have a good nights sleep! Current cost 50 pesos per person. El Chalten (SW): At the parking area of the ranger station/visitor center, at the start of the trail to Fitz Roy or at the parking lot of the water falls (a few km outside town). 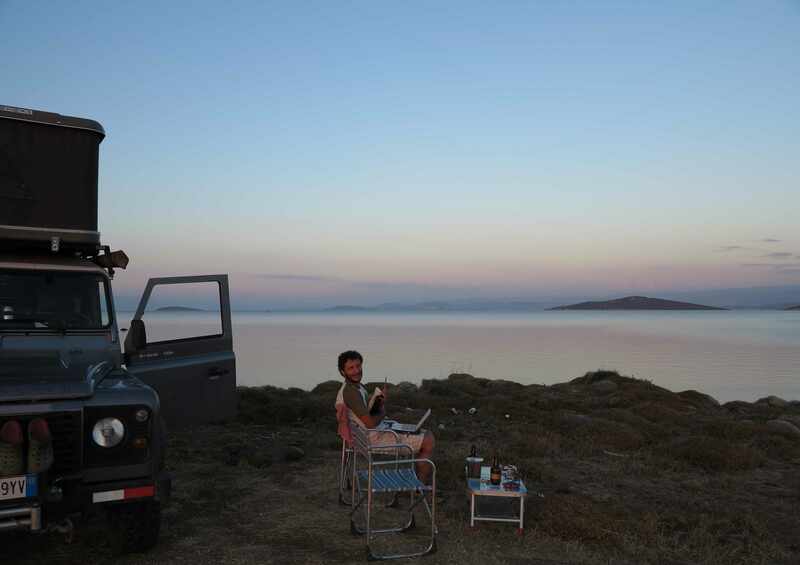 Close to Ushuaia (S): Estancia Harberton has 3 nice areas for free camping. The national park of Tierra del Fuego has free camping. 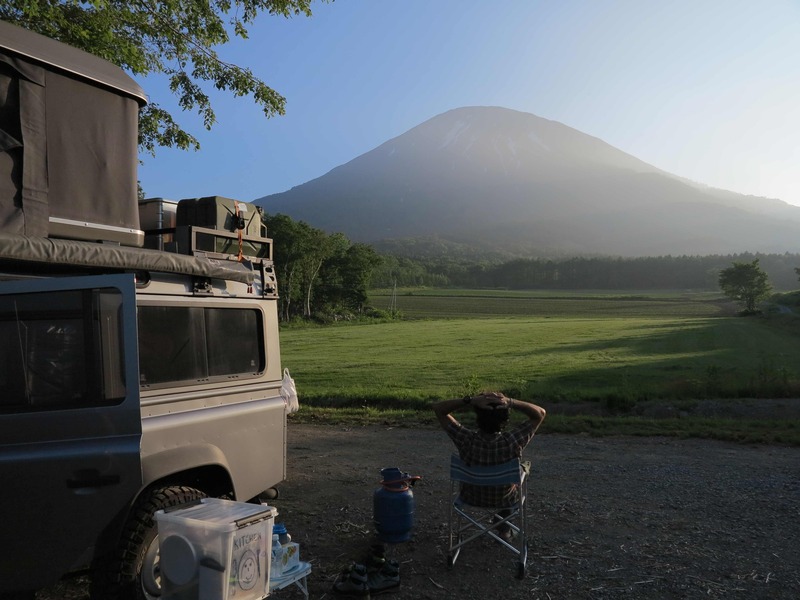 Japan is lovely and very safe for camping. Just be prepared to get up early as the Japanese are very early starters. And remember, you are a dubious stranger! Smile and say konnichiwa and don’t leave any garbage or mess. Most likely you will find a nice spot by the river or a quiet place in the mountains. If now, you can almost always find a nice and clean resting area along the road. An emergency option is also to sleep outside one of the many convenience stores (Lawson, Family Mart, 7/11). We did this one night as we had to be in Central Tokyo early next morning. As for showers: In the volcanic island chain of Japan there is always a hot spring (onsen) somewhere close by. Pay anything from 2-3 USD and upwards depending on the degree of luxury. Sometimes the nicest ones are the simplest and cheapest ones. In case you need a couple of days indoors, we would like to recommend these 3 hostels in Japan. All of them are super friendly, clean and make you feel at home! Kyushu Island, Aso city: Aso Base Backpackers Hostel, www.aso-backpackers.com. The lovely young owners of Aso Base. Hokkaido Island, Sapporo: Ino’s Place, www.inos-place.com. It is hard to beat the rotenburo (outdoor hot spring bath) at the hostel in Asahidake! 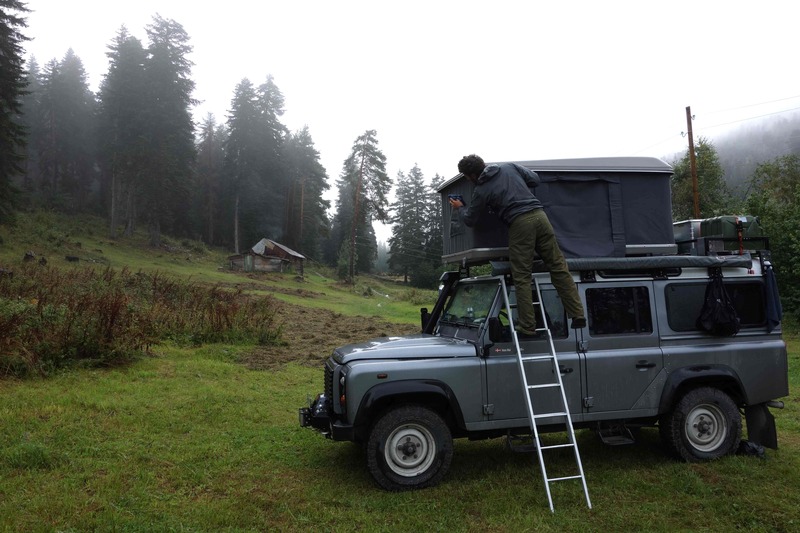 Russia is generally very easy for camping. 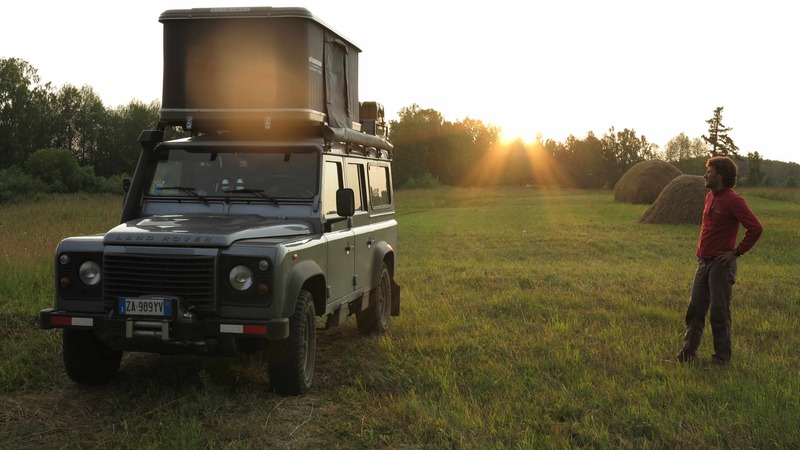 The Russians themselves love to get out and camp, fish, drink, make shashlyk (barbeque) etc. 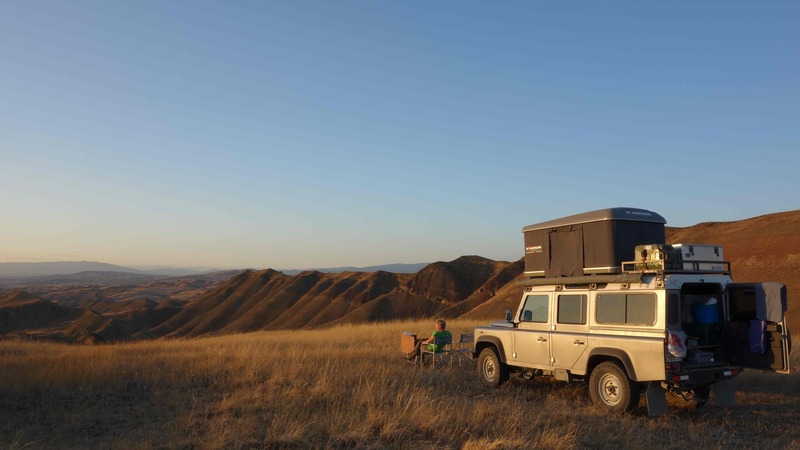 This passion of the Russians also creates one of the problems for the overlander who needs to sleep when he is camping! Loud Russian techno music over the car stereo is not very sleep promoting. So check your neighbors before settling down but otherwise it is safe and easy to camp out in nature. 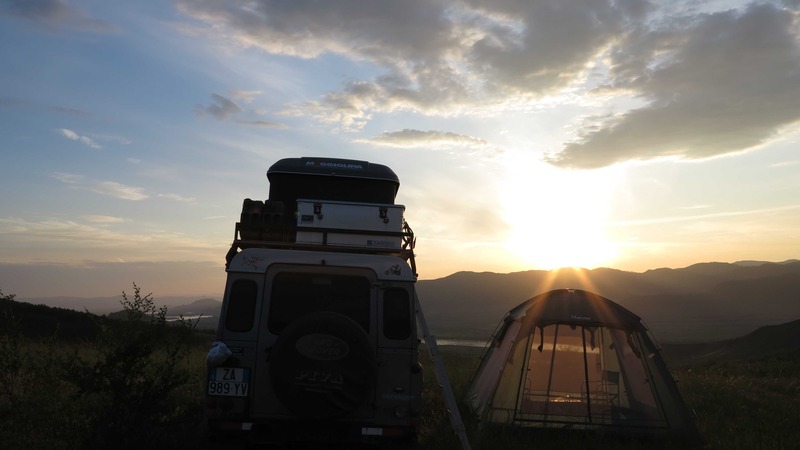 In the Russian Far East our best choice was often to sleep in one of the abandoned gravel pits that they used to construct the road. Word of caution: In the Russian Far East there are lots and lots and lots of mosquitos and biting flies. In Siberia a little bit less but still enough to be really annoying. If you can cook etc inside your car, fine. If not, we recommend to buy a mosquito tent! Showers: If the river is too cold, the lake to muddy or the mosquitos too many then we can recommend taking a shower in one of the beautiful grand old train stations along the Transsiberian Railway. Usually we pay around 2.5 EUR / 3 USD per person for a hot shower, sometimes including a towel. Look for the комнаты отдыха inside the train building and ask for душ = “dush”. 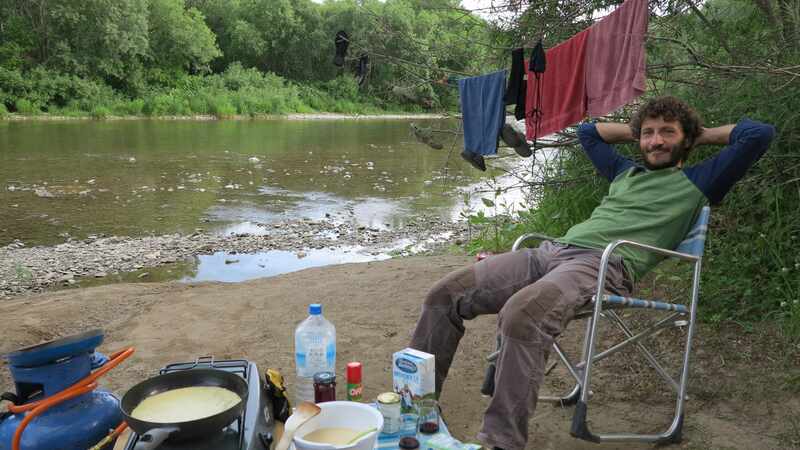 Camping by a nice river indluding a free (cold) bath. A favourite! 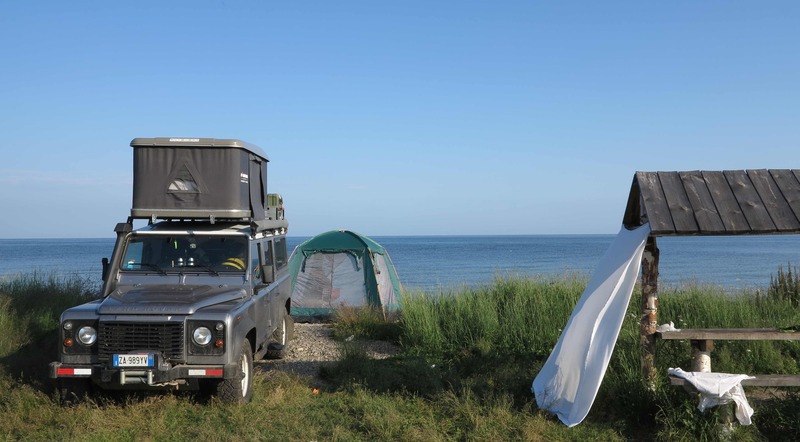 Camping by the Baikal Lake. 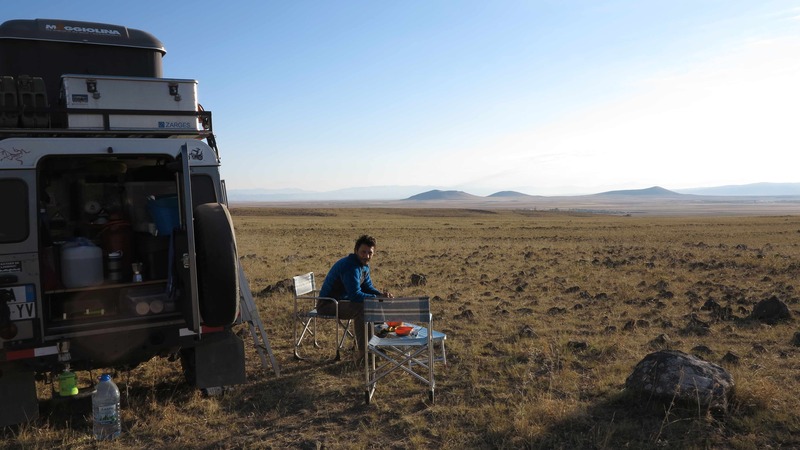 Camping in the hills close to Ulan Ude. Camping on a newly harvested field somewhere. 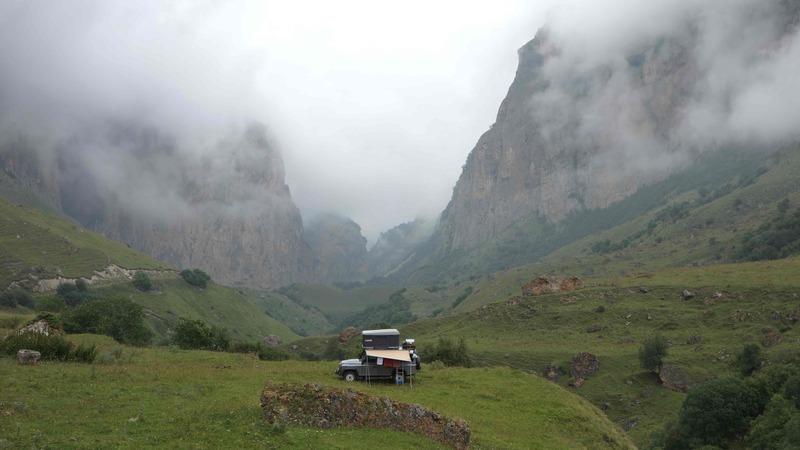 Camping in the valleys in Northern Caucasus. 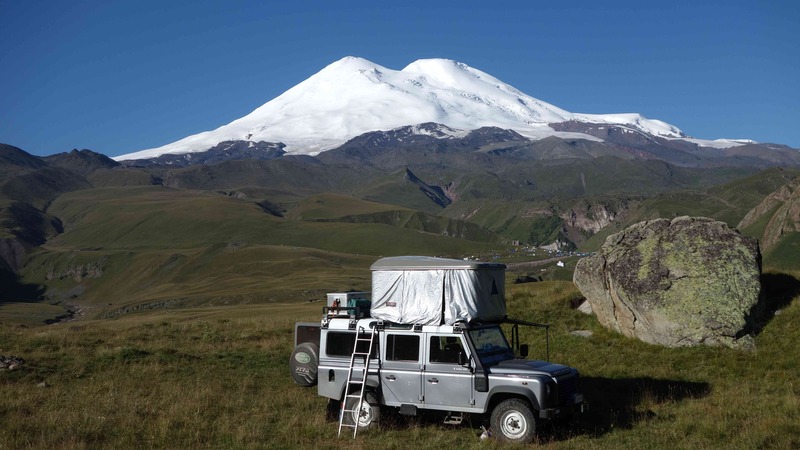 And finally, camping at the foot of Mount Elbrus! Georgia is very easy and safe for camping. If there were people close by our camping, we would ask them if it was ok to sleep there and they always said yes. If you pass by Kazbegi on your way down from the Russian border, there is a small forest on your right hand side just before the road crosses the river and enters the Kazbegi village. There you can camp for free. Otherwise there is a great campsite up in the hills by the Tsminda Sameba Church, if it is not windy. Camping close to a small hut in the mountains of the Svaneti region. The guys in the hut behind Frida were taking care of the cattle and did not mind at all that we camped there. Camping in the hills close to Davit Gareja on the border between Georgia and Azerbaijan. One of our nicest and most peaceful campsites of the trip. Some of the nicest campsites of the trip we found in Turkey! In the golden-yellow rolling hills of Anatolia or at the beach on the North Aegean coast. Of course we took full advantage of the 4×4 abilities of Frida to escape from the major roads. And we traveled out of the main tourist season and avoided the more touristy destinations. Close to the Armenian border and the ancient ruined city of Ani…. 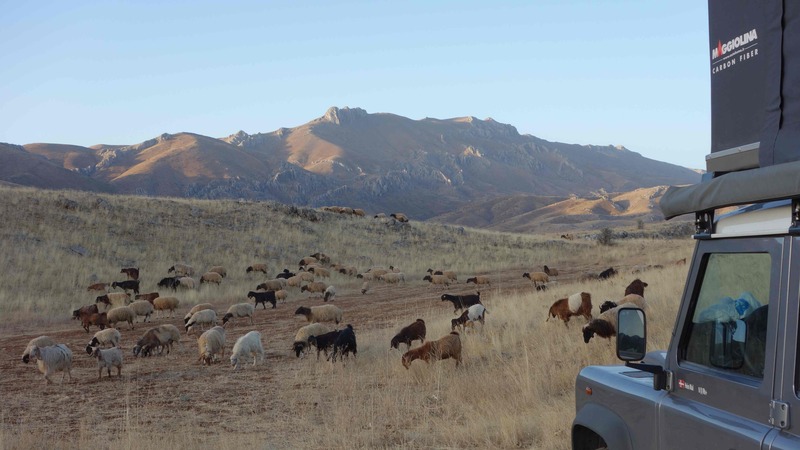 In the Central Anatolian hills…. On the north aegean coast close to Ayvalik…..
Our own private beach on the island of Bozcaada, north aegean coast…..
Free camping/wild camping is illegal in Greece and if you travel in the tourist season you should be prepared to hide very very well or to stay at a proper camping site. 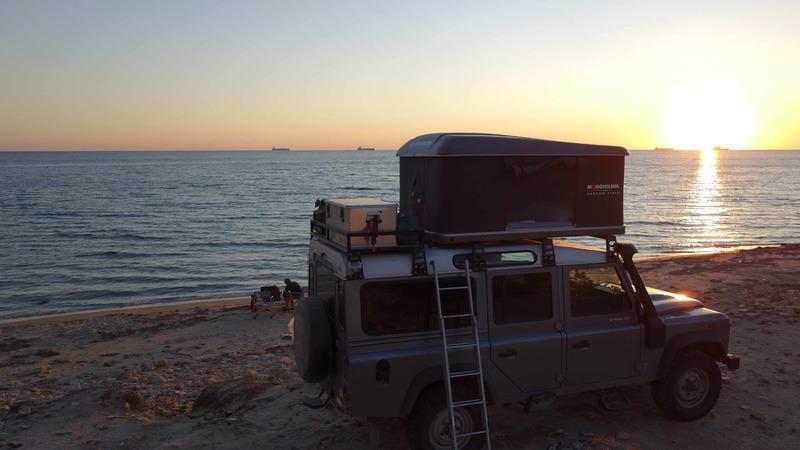 We did not have any problems to find places to camp for free but if you are in a touristy beach area you need to be a bit careful.